General facts: This is a limited edition of a twenty-one-year-old whisky from the ISlay distillery of Ardbeg, where the whisky has been matured in ex-bourbon casks (200 litres) and bottled at 46% without a hint of chill-filtration or colouring. The bottling was released for the Swedish monopoly market the 22nd of September last year and only in a limited amount of bottles. The price was about £324. Nose: Wet asphalt and raspberry jam. Gunpowder and arrak- and raisin ice-cream. And something that sweeps past and resembles classic skin lotion and freshly laundered sheets. Odd! Is there a faint perfumed note as well, perhaps? And really ripe, really sweet kiwi? All in all an interesting and yummy nose but also a little weird, in a sense. With water more peat smoke emerges together with licorice, and the nose becomes more focused. Good! Taste: And there was the peat smoke, hello! Not and extreme peat bomb, mind you, but instead a more refined but still apparent smokiness. Butter fried breading, oven baked apples, coffee and some seaweed. A touch of tar too, and some Läkerol. With water the flavours deepen and gains complexity, with burnt Finn crisp, parma ham, pen ink (! ), tinned pears and creamy vanilla ice-cream. Tasty and more:ish but does benefit from a few drops of water, in my opinion. Finish: But where did the aftertaste go? Some fruity peat smoke, some wax, a bit of charcuteries and a sort of metallic note, kind of like licking on a coin. However, without water it’s honestly thinner and shorter than I had expected. Sure, it tries to mess about a little in the beginning of the finish, but then it settles pretty fast. After adding water the finish becomes bigger, longer, more aggressive, more peppery and more lovely too. More cured meat, more peat smoke. Burnt bread and a touch of peppermint. Yet again – it benefits from some water added. In conclusion, this is tasty and has well-made. Without water it’s too unfocused and some taste notes are barely noticeable, which I find a shame since it is a fairly expensive whisky we’re talking about. After water added the whisky rolls up its sleeves and gets back into the fight, with a wider register and cokier attitude, which is pretty nice and makes my go “Yes – finally!”. Is it worth all that money, then? Nope, not to me at least. 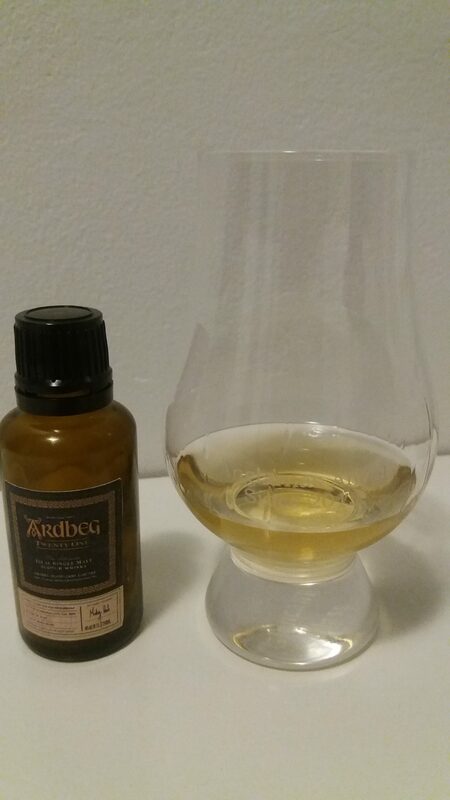 I generally like what Ardbeg’s cooking, but I hold the regular 10 yo in too high regards in order to find this bottling worth that price tag. However, when it comes to the twentyone-year-old and the flavour, without weighing in the price, this is quite good and nuanced (despite my initial hesitation) – at least after a drop of water or two. It’s a whisky with two different characters, and perhaps in a way kind of like the mullet of the whisky world: business in the front, party in the back!